Landscape Use: Accent succulent, excellent in containers, novelty plants, entryways, atriums, partially shaded rock gardens. 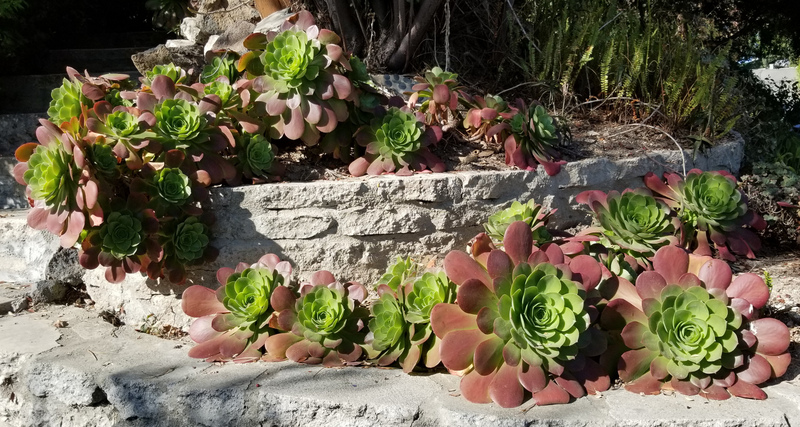 Colorful aeoniums work well with junipers as a bank cover in coastal southern California landscapes. Form & Character: High impact novelty succulent plant, stiffly upright and branched, sprawling with age, informal. Growth Habit: Moderately vigorous, upright and branched to 3 feet with a 2 feet spread when young to sprawling with age; stems produce adventitious roots when in close contact to soil. 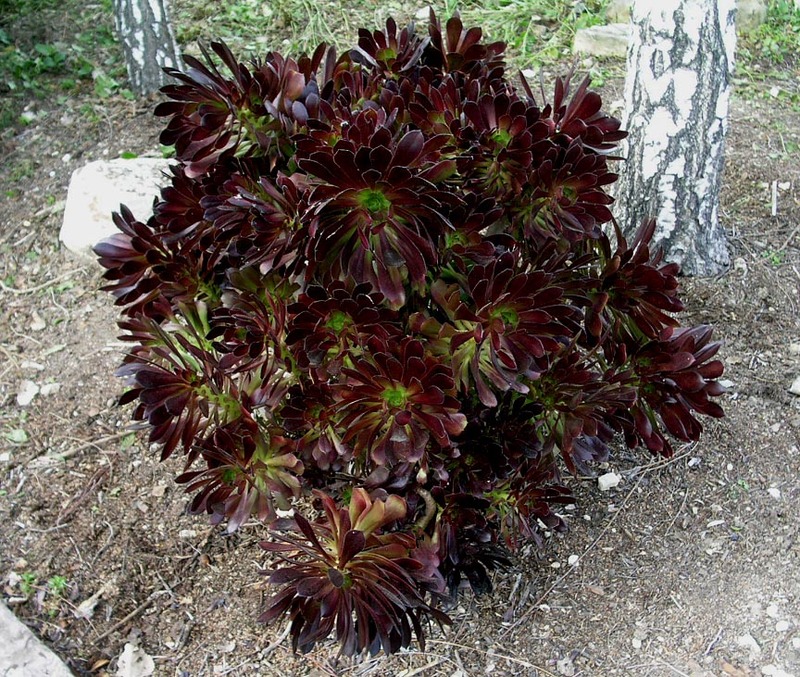 In the lower elevation southwest US including Phoenix, Aeonium is biologically active from October until April. In contrast, during the hot time of year Aeonium is generally dormant. 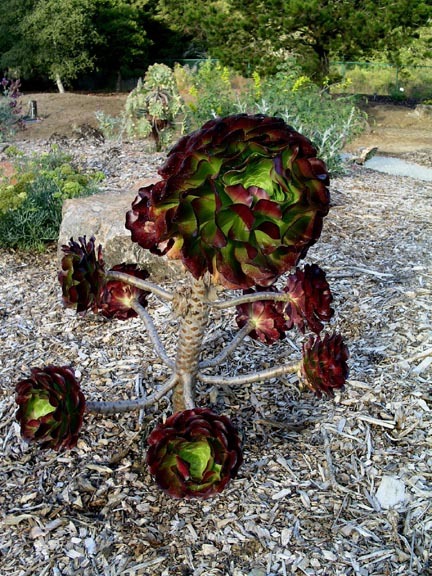 Foliage/Texture: Rosettes of oblong-shaped succulent leaves on thick brittle stems, green to purple, leaves simple and sessile, stems succulent yet brittle; medium coarse texture. 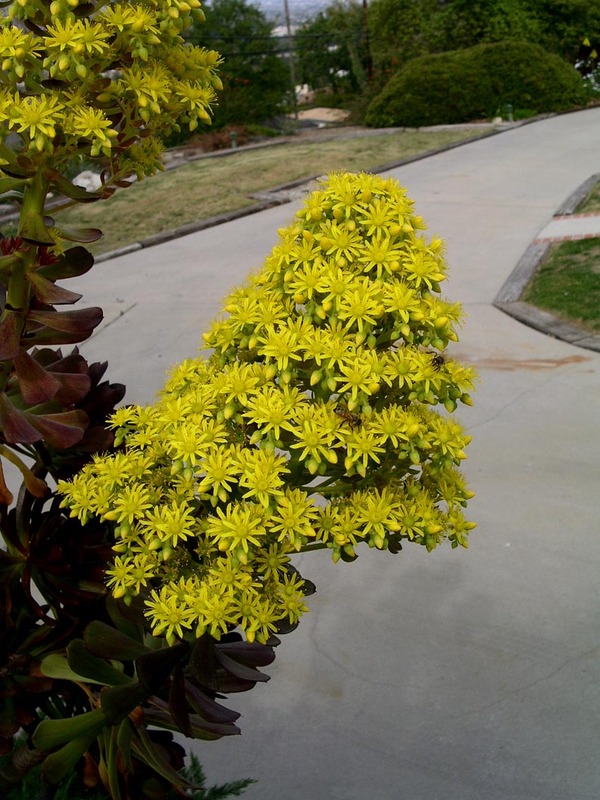 Flowers & Fruits: Aeonium flowers are usually in the form of large pendant racemes comprised of many, many small yellow flowers, flowers attract bees; fruit are insignificant. Temperature Frost and heat sensitive; grows best between 40oF and 100oF. In Phoenix, aeonium needs winter protection from freezing temperatures and is nearly impossible to keep alive outdoors throughout the summer - it just gets TOO hot here folks! Soil: Tolerant of most soil types, but does best in a light, well-drained soil. Watering: If container grown, then regular irrigations are needed. If grown in the ground then water sparingly throughout the warm season and during winter if winter rains are insufficient. On balance, do not overwater this plant as root rot might occur. Pruning: Removal of spent flower stalks and selective reduction pruning and some heading is all that is needed. Propagation: Stem cuttings (extremely easy to root during the cooler time of year). Disease and pests: Rarely scale and thrips, generally pest free. Root rot if soils are chronically wet. If grown as a container plant in a controlled environment, then mealy bugs can be problematic.